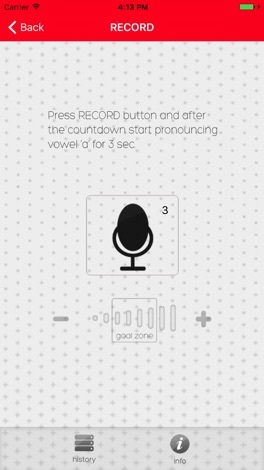 This software offers you the chance to test your voice and check for vocal fold health risk. 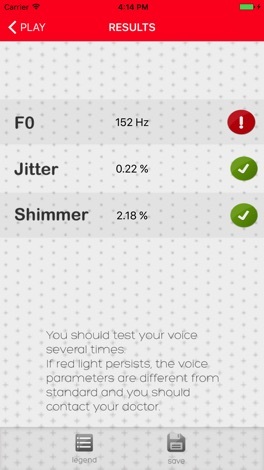 Three important voice parameters are measured: frequency, jitter and shimmer. Values are compared to thresholds given in references. Two level warning is issued. Human voice is a very complex phenomenon. It is essentially the sound uttered through the mouth of a human. Voice is the result of synergy of many human organs, namely lungs, vocal folds and articulators (tongue, palate, cheek, lips, etc.) within vocal tract. Sound is generated through the rhythmic opening and closing of the vocal folds. These organs are subject to various health risks. Experts in phoniatrics are able to determine the condition of vocal tract simply by hearing the human voice. They sometimes use sophisticated professional equipment, measure the voice parameters, evaluate the health condition of vocal folds and glottis and decide if medical treatment is required. Smokers and people who speak much as a part of their profession belong to a high-risk group for developing the vocal fold disease. 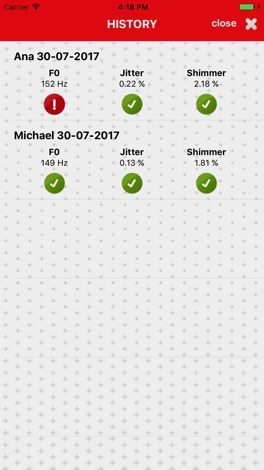 Values of fundamental frequency, jitter and shimmer are calculated and compared with predefined thresholds. Results of the comparison are presented in graphical and numerical form. 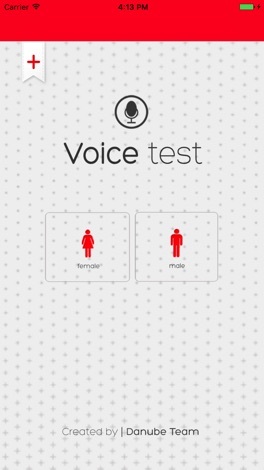 Voice of adult male and female are suitable for testing, not the children voice. The purpose of this program is to increase awareness among users to pay attention to the health of their vocal folds. Test results in this application have only indicative value and may in no case be a substitute for an examination performed by a professional. You should say long letter /a/ in natural way, best as a part of a word, like in five. 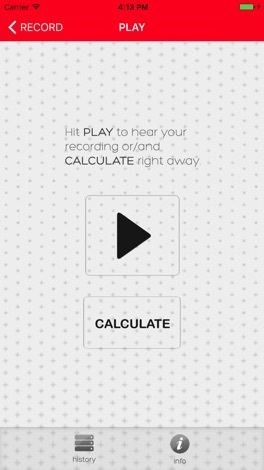 Try to keep the power indicator within goal zone during three seconds for correct recording. If results are not green, repeat the procedure several times. If warning persists, it indicates that the voice parameters are different from standard values and you should visit your doctor.